Got a fever, sore throat, or the flu? 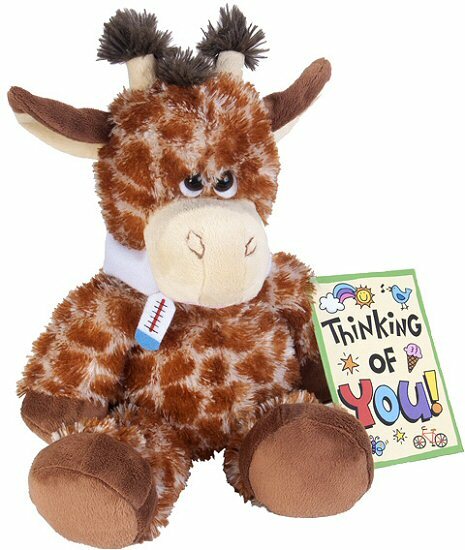 This adorable plush giraffe from the "Get Well" Buddies collection can certainly understand. In fact, she wants to see to it that you feel better by providing lots of cuddly comfort and support. With a white neck wrap around her throat, a felt thermometer taking her temperature, and a huggable body of soft rust-spotted fur with cream and brown accents, this sweet feverish giraffe stuffed animal offers her special brand of medicine in the form of soothing hugs and constant companionship. Includes a colorful Think of You! card for personalization. This adorable little plush giraffe has soft spotted fur of cream and rust, brown hooves, and a fluffy tail tuft.